READY TO BUY? START SAVING TODAY! DirectBuy offers millions of products at prices so low, we can't show them here. Traditional yet modern, the Pawleys Island Essentials Dining Chair with Arms exceeds all expectations of what an outdoor dining chair should be. Designed with style and comfort in mind, the Pawleys Island Dining chairs with arms look great at the ends of our Dining Tables and provide you with the utmost in comfort while you are dining. 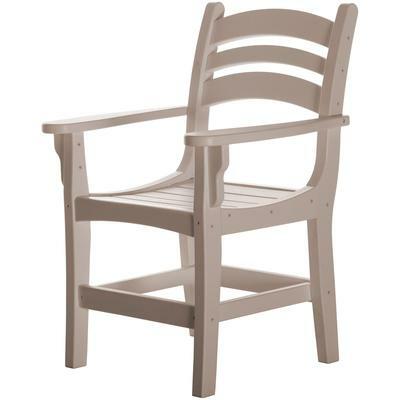 The Pawleys Island Dining Chair with Arms is constructed of heavy duty Durawood Poly lumber material and is held together by marine-grade, 316 stainless steel hardware to provide maximum durability. All screws and bolt heads are strategically hidden from the front view of the chair to give you a modern sleek look. This chair is a rare combination of superior craftsmanship, traditional design, and modern technology. All Pawleys Island Patio Furniture is proudly made in the USA, handcrafted in the Carolinas. Disclaimer: This vendor allows returns. The product must be returned in new or unused condition, in original carton and packaging material to receive refund. A request for return must be made within 15 days of receipt. The original shipping charges and return shipping will not be included in the refund. Please contact our Member Care team at 855.871.7788 to arrange return or if an item arrives damaged, defective or with missing parts. Image may vary depending on monitor settings.